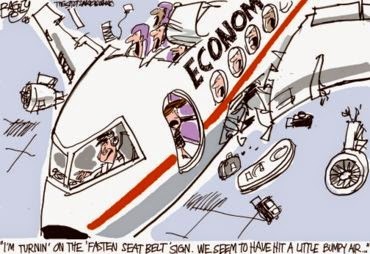 Home > Stocks > How Real is That 'Earnings Growth'? 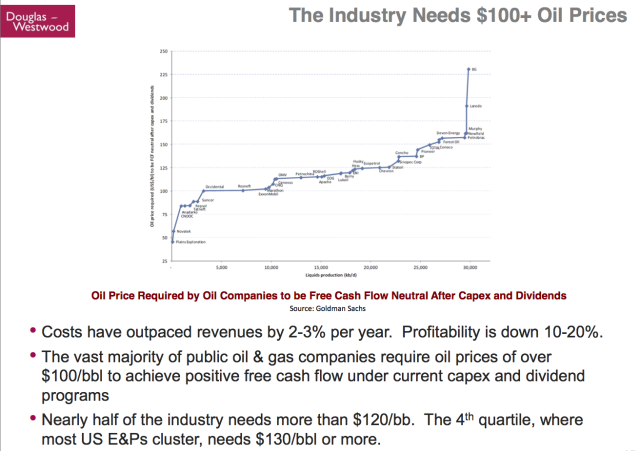 How Real is That 'Earnings Growth'? 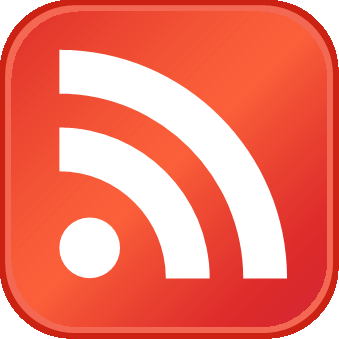 Heading into 2018, UBS has been one of the most bullish banks, with its equity analyst Keith Parker predicting the S&P500 hits 3,150 by year-end. 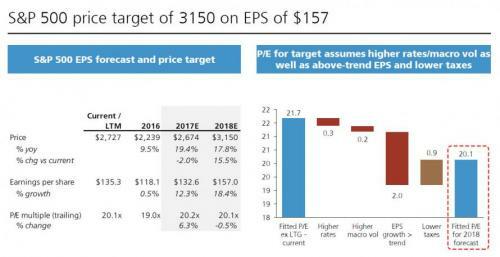 And while UBS' optimism is admirable if hardly unique with much of Wall Street expecting a similar return (which means that the pain trade is for everyone to be wrong), what is more interesting is how UBS gets to its target, and specifically its "EPS bridge" from 2017 to 2018E. What it reveals is that more than half of the (non-GAAP) EPS growth in 2018 is expected to come from the Trump tax cuts and buybacks. Specifically, as shown in the chart below, when moving from the 2017 non-GAAP number of 132.50 to the UBS 2018 forecast of 157, 55% of this 24.5 delta, or 13.60 is expected to come from the "Trump tax uplift" (10.30 EPS units) and the "Buyback tailwind" (another 3.30). Meanwhile, organic US GDP growth is expected to contribute just 6.5 to this bridge. 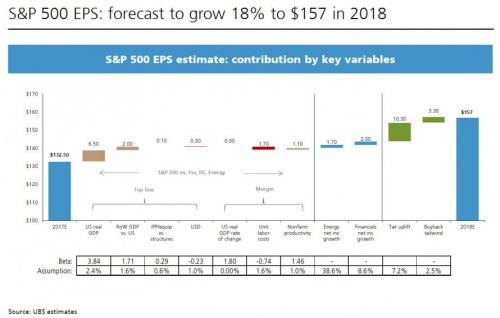 In other words, Trump's tax reform, which resulted in corporate tax cuts and a tax regime that has prompted a surge in buybacks courtesy of offshore cash repatriation, will boost EPS growth by more than double compared to what US economic growth would do alone! 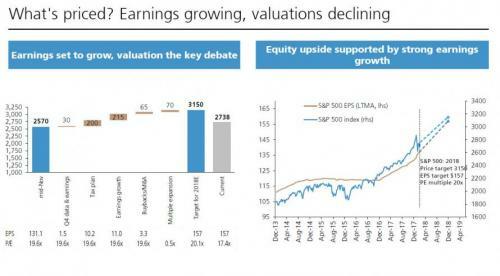 Ok, so now we know how UBS gets to one component of its year-end stock price, the EPS. What about the PE multiple it is applying to this number, which obviously has to be 20.1 for the numbers to fit. 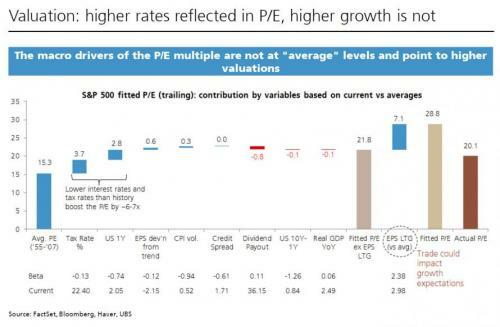 ... and while it does not state it explicitly, the reason why UBS believes the market is still cheap is because if one applies the goalseeked P/E of 28.8 to the bank's EPS estimate of 157, one gets an S&P number of 4,520, or as UBS says "The macro drivers of the P/E multiple are not at "average" levels and point to higher valuations." Surely, seen in this light, the bank's much more "modest" S&P target of 3,150 is downright cheap. So to summarize: 9 years into the world's 2nd biggest bull market, in the second longest economic expansion in history, a bank predicts that at a time when the Fed is aggressively hiking rates, S&P earnings will grow by 18% while a "credible" PE for the market is, drumroll, 28.8x! We look forward to a post-mortem of this analysis one year from now.